[WILLIAM PENN]. Newspaper. 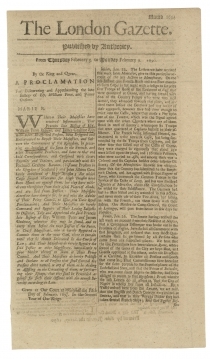 The London Gazette, February 9, 1690, 2 pp., 6¼ x 11¼ in. 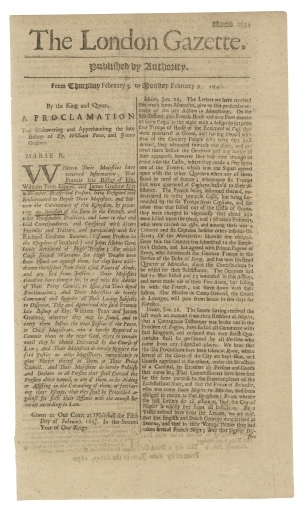 “…William Penn, Esquire...have designed & endeavoured to depose their Majesties & subvers the government of this Kingdom by procuring an invasion of the same by the French, & other treasonable practices...for which cause several warrants for High Treason have been issued out against them, but they have withdrawn themselves from their usual places of abode and are fled from justice…” (p. 1, col. 1). With other news from late 17th century London. William Penn (1644-1718) rejected his Anglican faith and joined the Society of Friends when he was 22 years old. His chagrined father, Admiral William Penn, had hoped his son would curry favor in the court of England’s King Charles II; instead, he saw his namesake persecuted and imprisoned during the confusion following the Interregnum and Restoration of the monarchy. 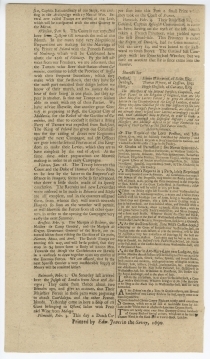 Because they would not swear a loyalty oath to Charles II, persecution of Quakers continued and helped sway Penn towards establishing a North American colony where religious rights would be protected. In 1677, Penn and other Quakers received land in West New Jersey. Penn remained in England, but worked to expand Quakerism in America. Fortunately for Penn, his father had provided Charles II a large loan, and the King settled accounts with the elder Penn’s estate by granting his son a huge tract—over 45,000 square miles—of land south and west of New Jersey on March 4, 1681. Penn the younger then wrote a charter for the colony new colony that included free elections, jury trials, and freedom of religion. Technically, Penn’s power was limited by the Crown, but as a propriety colony, Penn was given considerable latitude to govern as he saw fit. He created a system of government that would include complete freedom of religion for any believers (unique for the era), representative government, and separation of powers. Hoping to convert his lands into wealth for himself and his family, he aggressively marketed the colony and quickly attracted a diverse group of settlers. Unfortunately, his colony was not a financial success, and he died in debt.